The Swedish fashion brand, H&M, was established in 1974, originally being entitled as Hennes (translated from Swedish as 'hers'). The current full name of the label, Hennes & Maritz, came into the life when the founder Erling Persson bought Mauritz Widforss, a hunting and fishing equipment store (H&M). Ever since, the brand expanded its sales beyond the borders of Sweden opening stores first in other European countries and then in different corners of the world. Today H&M owns around 3300 stores in 54 markets. It has a huge diversity of categorized clothing, including women's and men's wear, maternity clothing and kids apparel. The H&M clothing are rather inexpensive and diverse, in other words H&M offers different kinds of trendy and chic clothing foll all styles for affordable prices. 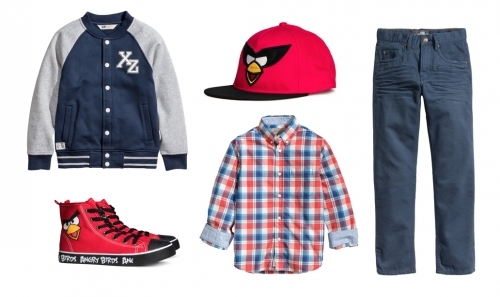 In regards to kids clothing, H&M is a perfect solution to ensure comfortable wear for a fast-growing child. Especially for babies there is no need to spend a fortune to purchase clothing; H&M offers all kinds of basics and essentials for affordable prices. Besides, the kids clothing are very nicely designed and fashionable. 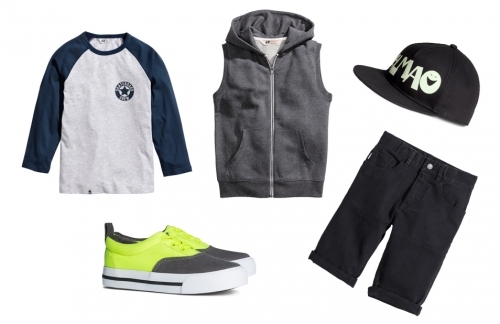 Here I composed several sets designed with H&M Kids wear. You can find and shop the below presented pieces (and more!) on the brand's website. Enjoy it and get inspired!